Pearl millet (Pennisetum typhoideum) was fermented with Lactobacilli or yeasts alone and in combination, and with natural microflora after various processing treatments, as grinding, soaking, debranning, dry heat treatment, autoclaving and germination. Fermentation was carried out at 30°C for 48 hours withLactobacillus plantarum (LP) andRhodotorula (R) isolated from naturally fermented pearl millet andLactobacillus acidophilus (LA),Candida utilis (CU) and natural microflora (NF). Germination and autoclaving, and debranning and autoclaving were the most effective processing treatments to reduce the phytic acid, amylase inhibitors and polyphenols. There was a further reduction in these antinutrients due to fermentation. 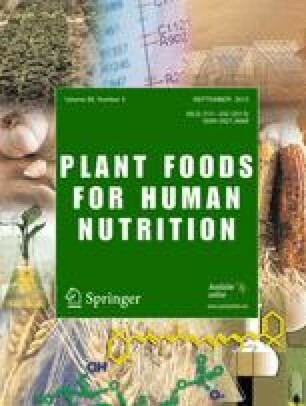 Phytic acid and amylase inhibitors were completely eliminated after fermentation in some of the samples especially in soaked, debranned and germinated ones. Polyphenols were altered non-significantly in general but fermentation with Lp+R and NF caused a significant increased in polyphenols.